Below are the planned events at Natural Whisperings and various Portland, Oregon area venues. Click on any of the flyer links or the Offerings page for more information about the workshops listed. Check back often to see future postings. Register and pay through our new online Registration. Private and semi-private sessions are also available outside of these organized events. If you have any questions, Contact us. Information: For more information, open and print any of the flyers below or visit Susan Smith's website. The following events are designed for horse owners and professionals, body workers and equine enthusiasts who would like to learn how to do some effective bodywork on their horse. The courses will include building blocks of equine health and energetic relationship with the horse. The work relies on the horse’s innate ability to self-correct and can have profoundly sustainable results. Emphasis in class will be on developing feel and timing in contact. Neither class requires a pre-requisite. Please Note: No Haul-ins. No Audits. No pets. Each class Limited to 10 participants. *Sessions: In addition to the equine workshop and study group described below, Susan is offering human Ortho-Bionomy® sessions (treatment, feedback, consults) and mobile horse EBB sessions (we drive to your barn). Human and Horse Sessions are available for 6/21/2019. Book in advance to reserve your session time! Register Now with the green button below or on our Registration page! (Or $175 deposit by 5/22/19, $285 balance by 6/15/19). Description: It is often said, “no hoof, no horse.” The same can be said for the entire limb of the horse. Often the hooves are healthy but something causes restriction in the limb itself. This class aims to foster a holistic view of the horse and people’s relationship to it through non-force intention. Equine Body Balance balances the horse’s systems and allows for better functionality. It allows people to be more proactive in their horse’s health care by learning how to observe a horse’s condition, and hands-on techniques to address injury, restriction and improve overall movement, health and soundness. Equine Body Balance is simple and non-invasive, and can be learned by any interested horse owner or professional. While the work is powerful, it can be applied without injury. Owners can effectively support their horse’s healing with this training. Our question always is: How can we bring greater comfort, mobility and efficiency to the horse with bodywork? Learn assessment through observation, further your palpation skills, encourage movement from within to without. Learn to prioritize when bodywork, follow-up and other intervention is needed on an individual basis. Plus, take home sustainable Equine Body Balance techniques to use with your horse along with comprehensive materials! This material is not a substitute for veterinary care, but a complement to it. Assessment: Observing the horse, its gait, movement patterns: limb-to-spine. Approaching the horse: Greeting, coming into connection. Learn tissue differences: Sinewy, squishy, tissue with bounce-back, hard. Techniques: Range of motion, lifting legs in position of comfort, addressing trigger points. Safety + Responses: Observing the horse’s reflexive action & technique response. This Equine Study Group is the same one Susan Smith will be presenting at the 2019 Ortho-Bionomy® Conference in French Lick Springs Resort: A special treat for those who could not attend the conference! Horses do not have the ability to “say” when something hurts. It’s important to use our Ortho-Bionomy® knowledge to develop “workarounds” or ways of treating the horse taking into account his or her trauma. Horses are subject to many big injuries, in some cases like traffic accident injuries – pulling back on halters, restrictive training practices, pasture accidents, trailer accidents, flipping over backwards, etc. Some horses are not going to be amenable to Ortho-Bionomy® manipulation if they have suffered a trauma, either old or new. First of all we need to recognize what the horse is trying to convey: pain, pleasure, discomfort, agitation. Next, adapt our techniques to find preferred position and/or use a different technique entirely. Some of these techniques may involve holding space, holds instead of initiating movement, alternative techniques, support for joints, support for the hooves. Homework: Upon enrollment, students will receive an email packet containing written information, video and article links to read and view before the onsite portion of the study group. Students will watch a series of videos with supporting information about each given case study. Please come with questions. Brief Biography: Susan Smith has had a lifelong love of horses and began her interest in bodywork while endurance riding. 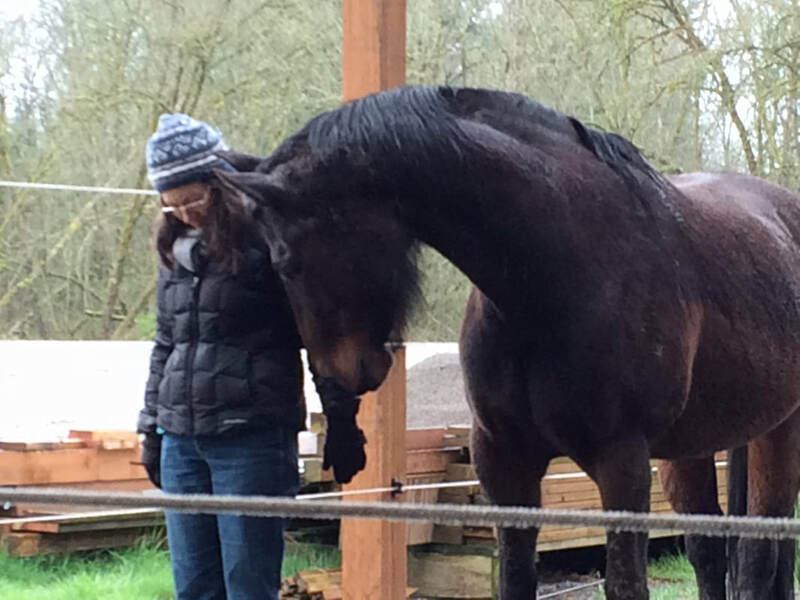 The need to keep horses and herself fit led her to study bodywork for both equines and humans. Susan's certifications include: Registered Instructor & Advanced Practitioner Ortho-Bionomy® & Equine Ortho-Bionomy®, Founder of Equine Body Balance™, Practitioner of Equine Positional Release (EPR), Member ABMP, Society of Ortho-Bionomy® International, Independent Liberty Trainers Network. We will be working with Natural Whisperings’ herd of seven very different horses. Class size is limited to 10 students, so sign up today! SPECIAL EVENTS REFUND POLICY: Deposits are non-refundable. Cancellations within four weeks prior to the event are non-refundable, but payments may be applied to a future special event. If the event is cancelled by us or the presenter, you will receive a refund (less PayPal fees).